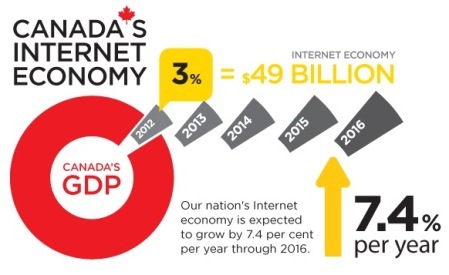 Ever wondered how often Canadians are online, what their preferred domain is, or how much of our gross domestic product is generated by the Internet economy? These are just some of the facts available in the Canadian Internet Registration Authority’s (CIRA) 2013.ca Factbook. The Factbook, which will tell you Canadians rank first in the world for Internet usage with an average of 45 online hours every month, is divided into four main sections: the Global Net, .ca’s in Canada and the Canadian Internet Economy, Canada Online and .ca and the World. There’s facts and research about the global domain industry (and specifically .ca), as well as on the state of the Internet in Canada. For example, if you feel like your Internet bill is too high, you’re right. According to the Factbook, Canadians pay more for broadband speed than 19 other countries. Other tidbits: 49 per cent of Canadians prefer .ca for business compared to 17 per cent that prefer .com, while the Internet economy accounted for three per cent of Canada’s GDP in 2012.